Photo by John Perrin Flynn. Everyone seems to be on the brink of crisis in Samuel D. Hunter’s drama Pocatello, now playing at Rogue Machine Theatre’s new home base theater in East LA. 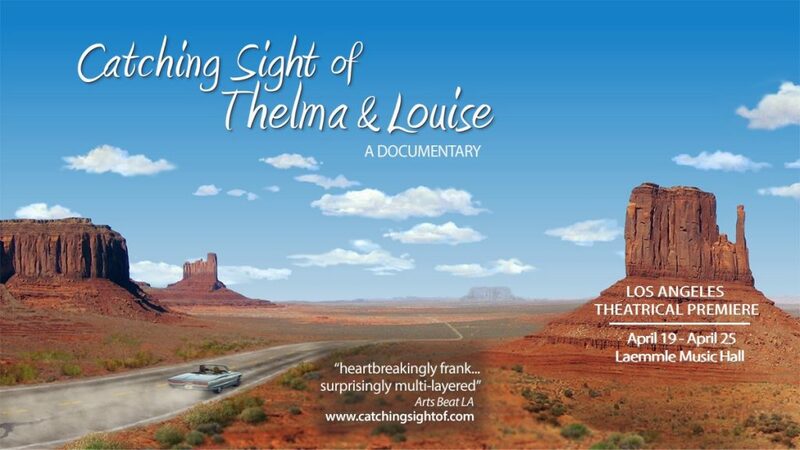 In Hunter’s one-act drama, numerous characters grapple with emotional and spiritual isolation in a remote Mid-western town. 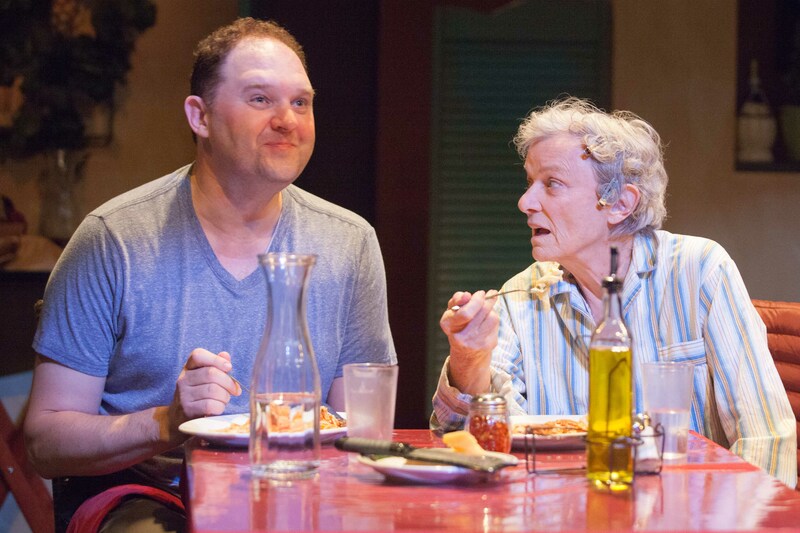 The play opens in a slightly cheesy Italian-themed chain restaurant. It’s managed by central character Eddie, a people-pleaser with a permanent smile plastered to his face (well-played by Mathhew Elkins). Seated at one table are Eddie’s family members, including his impossibly demanding widowed mother Doris (Anne Gee Byrd) and his irritable older brother Nick (Rob Nagle) who, for the first time in four years, has returned for a brief visit to his small home town of Pocatello, along with his patient wife Kelly (Rebecca Larsen). 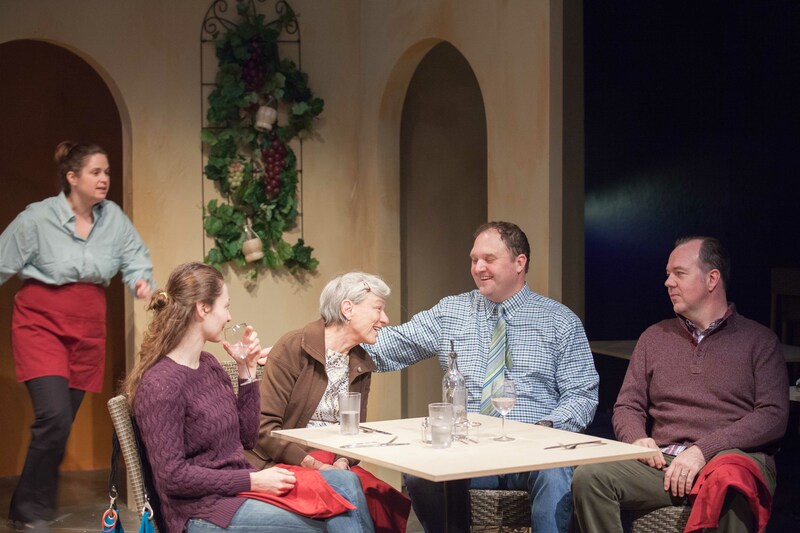 At the other table is the family of one of the servers, Troy (Justin Okin) — Troy’s cranky Dad Cole (Mark L. Taylor), also Tammy (Tracie Lockwood) and Becky (Eden Brolin) — Troy’s wife and sullen teenaged daughter. It’s a cacophony of overlapping dialogue as we overhear the bickering going on at each of these tables of dysfunctional family members. Pocatello, Idaho is a run down town verging on extinction. We learn that ever since the mill closed down, jobs have been scarce. Even this Italian restaurant is about to go out of business — bad news that Eddie goes to great lengths to hide from his struggling employees. He’s been paying his own savings into the restaurant’s tills to stave off the inevitable, but it’s all closing in on him. The loathing that Eddie’s brother Nick harbors for his home town is palpable. He’s apparently only visiting under duress, at Eddie’s request, but he can’t wait to get out of there and back to his life in St. Paul. Privy to Eddie’s bleak prospects, he urges his brother to leave and forge a better life for himself. Eddie is perplexed, explaining “I just feel so connected to this town. My family has been here forever.” It doesn’t matter that his father endured a tragedy here or that his mother keeps him at arm’s length, emotionally. Eddie gives a passionate and bittersweet speech about what belonging somewhere means to him. The backstory for each character, and their respective discontent, is carefully sketched by Hunter and delicately rendered by the superb cast, that also includes Jen Pollono and Melissa Paladino sharing the role of surly server. John Perrin Flynn once again directs with aplomb. Pocatello by Samuel D. Hunter. Runs through March 27, 2016. (855) 585-5185 or online here.